After the unscheduled off week last Saturday due to Hurricane Florence, WVU is back in action for the start of Big 12 conference play. Kansas State comes to town and presents a unique challenge for West Virginia. I’m fascinated by this game. I think it will be a great case study in analytics versus what you see on the field. Since joining the Big 12, WVU has averaged just 19 points per game against the Wildcats. No other team in the league has held West Virginia to a lower points per game average. WVU has been held scoreless in a half in each of the last two games against the Wildcats. After losing the first four matchups in the series, the Mountaineers have won the last two games against K State, but they've been close. A rare missed field goal from Matthew McCrane two years ago, allowed West Virginia to escape with a 17-16 win. Last year, West Virginia hung on for a 28-23 win after scoring all of its points in the first half. A hail mary heave by Will Grier to Ka'Raun White for a touchdown to close the first half, proved to be the difference in the game. The average margin of victory over the last four meetings between these programs is just 3.5 points per game. So history (and the numbers) suggest this will be a close game. But, the game tape says something different. West Virginia has rolled its first two opponents. The offense is averaging 45 points per game and looks as we thought it would look. Potent. Kansas State has struggled mightily so far in 2018. A near loss in the opener to FCS program South Dakota, a complete mauling at the hands of Mississippi State and an easy win over hapless UTSA, has left fans in Manhattan scratching their heads. An experienced offensive line and two quarterbacks who won games last year returned for the Wildcats this season, but the offense has struggled. Despite playing such a week non-conference schedule, Kansas State is ninth among Big 12 teams in points scored per game (26 points per game). The other side of the ball hasn’t been much better for the Cats. The alarm bells went off defensively when Mississippi State ran for 384 yards two weeks ago in Manhattan, including 154 by Bulldog quarterback, Nick Fitzgerald. Add in questions at linebacker and defensive back and Kansas State’s defensive unit is in an extremely tough position facing the explosive WVU offense. I’ll leave you with one last nugget on the analytics side of this game. West Virginia is a 16 point favorite today. In the last eight games in which Kansas State head coach Bill Snyder’s Wildcats have been double digit underdogs, they are 8-0 against the spread. The numbers suggest this game will be close. The eye test says it won’t. Which one will be right this weekend? Leave a comment below or send me a tweet: @BradHowe07 and let me know what you think the score of the game will be. NOTE: Our Metronews crew will have nine and a half hours of WVU football gameday coverage beginning at noon today. 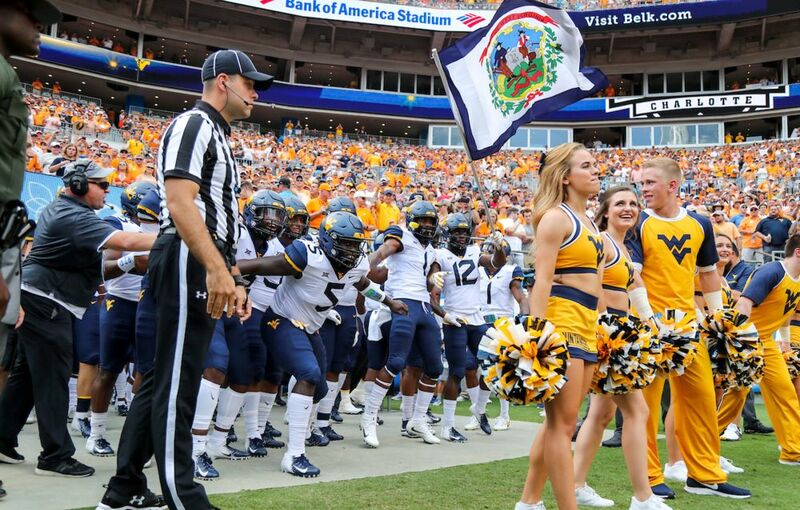 Editor's Note: Top photo shows WVU coming on to the field prior to the start of the contest with Tennessee, while Leddie Brown is shown getting yardage in the same contest. Bottom photo shows Coach Bill Snider of KSU talking with Dana Holgorsen prior to the team's matchup won by WVU in 2016 at Mountaineer Field. Photos by Ben Queen of www.benqueenphotography.com.